Cytonn Real Estate, our development affiliate, will this week break ground on The Ridge, a Kshs 12 bn comprehensive, luxurious, mixed use development on 10 acres in Ridgeways, Nairobi, which will have residential apartments, retail and office space and serviced apartments. Phase 1 is already 31.0% sold prior to groundbreaking and launch date buyers have registered a 27.0% capital appreciation. Groundbreaking will be on Monday, 15th May, at 10.00 AM at the site and H.E. Governor of Nairobi City County, Dr. Evans Kidero will be the guest of honor. The Alma, which is over 55.0% sold, has delivered an annualized return of 55.0% p.a. for investors who bought off-plan. See The Alma. Following the completion of sales for Amara Ridge, we are currently looking for land in Karen for our next development. We are also looking for 3-10 acres of land in Garden Estate, Muthaiga North, South C and Lang’ata. Contact us at rdo@cytonn.com if you have any land for sale or joint ventures in the above areas. T-bills subscriptions remained high but declined slightly during the week to 176.3%, compared to 196.2% recorded the previous week. The subscription rates for the 91, 182 and 364-day papers came in at 298.6%, 196.2% and 107.5% compared to 295.7%, 253.8% and 98.9% the previous week, respectively. The 91-day paper had the highest subscription rate during the week, an indication that investors are biased towards short investment durations due to uncertainty in the interest rate environment. Yields on the 91 and 182-day papers each dropped by 10 bps w/w to 8.7% and 10.4%, from 8.8% and 10.5%, the previous week, respectively, while that of the 364-day paper remained unchanged at 10.9%. The accepted yields on all three papers came in at the same rate as the weighted average market yields, with the overall acceptance rate at 70.4%. The government is not accepting more money than they are putting up in the auction, an indication that they are not under pressure to borrow and so the market reacted by bidding lower this week for both the 91 and 182-day paper. Bank’s holdings in government papers has increased to 55.1% of total debt from 51.1% at the beginning of the year as government continues to crowd out the private sector following the capping of interest rates. The average interbank rate declined to 5.5% from 6.1% recorded the previous week as the market witnessed a net liquidity injection of Kshs 12.4 bn compared to a Kshs 11.8 bn reduction the previous week. The net liquidity injection during the week was aided by increased government payments, term auction deposit maturities and T-bill redemptions that totaled Kshs 98.9 bn, compared to Kshs 64.5 bn the previous week. Central Bank of Kenya (CBK) was also active in the market, with repos worth Kshs 22.0 bn, transacted at an average rate of 5.9%. This week, the Kenyan Government re-opened two bonds (FXD 2/2010/10 and FXD 1/2009/15), with effective tenors of 3.4 and 7.4 years, and coupons of 9.3% and 12.5%, respectively, in a bid to raise Kshs 40.0 bn for budgetary support. From the recent T-bill auction, it is important to note that the government is not under pressure to borrow, despite (i) having only borrowed Kshs 205.8 bn from the foreign market, which is just 44.5% of its foreign borrowing target of Kshs 462.3 bn, and (ii) the Kenya Revenue Authority (KRA) has already missed its first half of 2016/17 fiscal year revenue collection target by 3.2%, and is also expected to miss its overall revenue collection target of Kshs 1.5 tn for the current fiscal year due to depressed earnings growth by corporates. The reduced pressure to borrow is because (i) the government is also behind its spending target, with total expenditure for the first half of the 2016/17 fiscal year coming in at Kshs 928.5 bn, which represents 83.6% of the pro-rated target of Kshs 1.1 tn, and (ii) the government is ahead in domestic borrowing having borrowed Kshs 310.1 bn against a target of Kshs 254.9 bn (assuming a pro-rated borrowing throughout the financial year of Kshs 294.6 bn budgeted for the full financial year). Given that the two bonds (FXD 2/2010/10 and FXD 1/2009/15) traded on the secondary market at yields of 12.5% and 13.2% as at 5th May, 2017 for the 3.4 year and 7.4 year bonds, respectively, and market liquidity remains high, we expect investors to bid for the bonds at yields close to the secondary market yield, and we therefore recommend a bidding range of between 12.5% - 13.2% for the FXD 2/2010/10 and 13.0% - 13.9% for the FXD 1/2009/15. According to Bloomberg, yields on the 5-year and 10-year Eurobonds, with 2.2 years and 7.2 years to maturity, declined by 20 and 10 bps w/w, respectively, to close at 4.0% and 6.5%, from 4.2% and 6.6%, the previous week, respectively. Since the mid-January 2016 peak, yields on the Kenya Eurobonds have declined by 4.8% points and 3.2% points, respectively, for the 5-year and 10-year Eurobonds due to stable macroeconomic conditions. The declining Eurobond yields and Standard & Poor’s (S&P) having maintained Kenya’s foreign and local currency sovereign credit ratings for the short and long term at “B+/B”, respectively, are indications that Kenya remains stable and hence an attractive investment destination. The Kenya Shilling remained relatively stable against the dollar during the week to close at Kshs 103.2, from Kshs 103.1 recorded the previous week. However, the Shilling is likely to be under pressure in the coming weeks on account of (i) increased dollar demand from oil importers as we expect oil prices to increase after the OPEC meeting, scheduled on May 25th, to decide on production policy for the second half of 2017, with expectations that the group will cut down further on production, and (ii) sugar imports, as production declined due to low rainfall experienced in October and November 2016, thus requiring the government to import an additional 400,000 tonnes over the course of the month in order to meet the demand for sugar in the country. On a year to date basis, the shilling has depreciated against the dollar by 0.7%. With the current forex reserve level, currently at USD 8.3 bn (equivalent to 5.5 months of import cover), we believe the CBK will be able to support the shilling in the short term. According to the March 2017 Leading Economic Indicators report by the Kenya National Bureau of Statistics (KNBS), the economy seems to be undergoing some tough times, with (i) volume of trade declining by 10.4% m/m to Kshs 178.8 bn in February, from Kshs 199.6 bn in January, compared to a decline of 5.8% the same time last year, (ii) the quantity of coffee auctioned at the Nairobi Coffee Exchange (NCE) declining by 10.2% m/m to 5,460 MT in March, from 6,080.6 MT in February, whereas the quantity of coffee exported rose by 20.4% m/m to 3,868.4 MT in February, from 3,213.6 MT in January, (iii) exports declined by 1.8% m/m to Kshs 48.0 bn in February, from Kshs 48.9 bn in January, while imports declined by 13.2% to Kshs 130.8 bn, from Kshs 150.7 bn over the same period, (iv) the quantity of tea produced decreasing by 31.5% m/m to 22,605.0 MT in February, from 32,991.0 MT in January, with the quantity of tea exported contracting by 27.0% m/m to 33,897.7 MT, from 46,434.4 MT over the same period, (iv) tourist arrivals declining by 8.7% m/m to 72,730 in February from 79,690 in January, and (v) inflation has been on the rise, closing April at 11.5%. Some of the positives, however, were (i) the Broad Money Supply (M3), a key indicator for monetary policy formulation, increased by 2.3% m/m to Kshs 2,832.7 bn in March, from Kshs 2,767.9 bn in February, which indicated that the money supply is not inflationary, and (ii) the currency has remained stable over the period. We still believe that the economy will do well in 2017, bearing in mind that the data released by KNBS is just considering activities over a one-month period. Despite this, we expect to see a decline from last year due to a slowdown in agriculture and financial Intermediation, and we have seen the World Bank and IMF revise downwards the projections for this year to 5.5% and 5.3%, respectively. As per our Kenya 2016 GDP Growth and Outlook, we maintain our projection that the economy will grow by 5.4% this year. The rates in the fixed income market have remained stable, despite indications of possible upward pressure on interest rates. The main factors supporting the low rates are (i) the Government is ahead of its domestic borrowing target for the current fiscal year, having borrowed Kshs 310.1 bn against a target of Kshs 254.9 bn (assuming a pro-rated borrowing throughout the financial year of Kshs 294.6 bn budgeted for the full financial year), (ii) the government is behind its spending target, with total expenditure for the first half of the 2016/17 fiscal year coming in at Kshs 928.5 bn, which represents 83.6% of the pro-rated target of Kshs 1.1 tn, while development expenditure for the first half of the 2016/17 fiscal year had an absorption rate of 73.8% against 92.5% for recurrent expenditure. Given that the government has historically exceeded the absorption rate on recurrent expenditure, averaging 103.5%, while the development expenditure has averaged 65.0%, leaving the overall budget absorption rate below 100.0% consistently in the last 5 fiscal years, there still exists upward pressure on interest rates, but may be subdued unless spending picks up, and (iii) the Government may also be looking at concessionary loans to finance the expenditure rather than borrowing from the foreign market. Some of the factors putting pressure on interest rates are (i) the government has only borrowed Kshs 205.8 bn of the budgeted foreign borrowing, representing 44.5% of its foreign borrowing target of Kshs 462.3 bn, and (ii) the Kenya Revenue Authority (KRA) is expected to miss its overall revenue collection target of Kshs 1.5 tn for the current fiscal year having missed its first half target. In conclusion, the possible budget deficit and high inflationary environment that we are currently in, create uncertainty in the interest rate environment as domestic borrowing may exert an upward pressure on interest rates, and result in longer term papers not offering investors the best returns on a risk-adjusted basis. It is due to this that we think it is prudent for investors to be biased towards short-term fixed income instruments. During the week, the equities market was on an upward trend with NSE 20, NASI and NSE 25 gaining 3.1%, 1.9% and 1.8%, respectively, taking their YTD performances to 1.8%, 3.3% and 3.0% for NSE 20, NASI and NSE 25, respectively. This week’s performance was driven by gains in large cap stocks such as Co-op Bank, KCB Group, Safaricom and Standard Chartered Bank, which gained 16.8%, 9.1%, 3.8% and 3.1%, respectively. 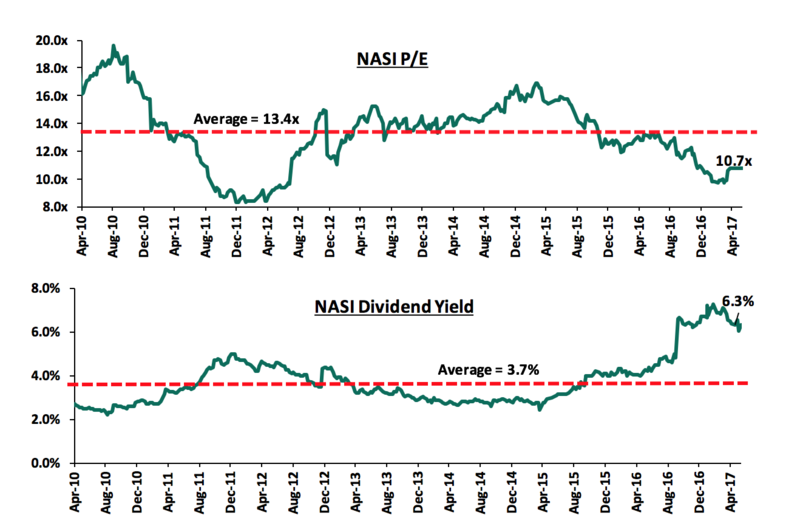 Since the February 2015 peak, the market has lost 41.0% and 22.4% for NSE 20 and NASI, respectively. Equities turnover increased by 54.5% to close the week at USD 31.8 mn from USD 20.6 mn, the previous week. Foreign investors turned net buyers with a net inflow of USD 0.2 mn compared to a net outflow of USD 2.7 mn recorded the previous week, with foreign investor participation slightly decreasing to 62.7%, from 63.2% recorded the previous week. Safaricom and KCB were the top movers for the week, jointly accounting for 62.8% of market activity. We expect the Kenyan equities market to be flat in 2017, driven by (i) slower growth in corporate earnings, and (ii) neutral investor sentiment mainly due to the forthcoming general elections. The market is currently trading at a price to earnings ratio of 10.7x, compared to a historical average of 13.4x, and a dividend yield of 6.3%, compared to a historical average of 3.7%. The current 10.7x valuation is 10.6% above the most recent trough valuation of 9.7x experienced in the first week of February 2017 and 29.1% above the previous trough valuation of 8.3x experienced in December 2011. The charts below indicate the historical P/E and dividend yields of the market. The President of Kenya this week signed the Movable Property Security Rights Bill 2017 into law, which seeks to facilitate use of movable assets as collateral for credit facilities. This new law will allow borrowers to use a single asset to access credit from different lenders through formation of a centralized electronic registry for mobile assets that financial institutions can use to verify the security offered. Some of the movable assets include electronics and jewellery, among others. The centralized registry will promote consistency and certainty in securing financing relating to movable assets. Financial institutions have, for a long time, focused on immovable assets like land and houses as collateral to access credit because of a lack of a central database they could log into and make a claim on movable assets attached as collaterals to a loan. As highlighted in our Cytonn Weekly #47, implementation of this law will (i) enhance the ability to access credit using movable assets, and (ii) provide an opportunity for banks to create a niche, especially in the SME and private household loans segment. However, the implementation of the law may be delayed as the government has to make regulations prescribing to issues such as the minimum value of assets to be listed and how their existence shall be ascertained. Besides, its success shall still be based on the credit ability of the borrowers since we are yet to have well-established markets to sell the collateral upon default. This law, in our view, might not increase loans disbursement under the current interest rates regime. KCB Group released Q1'2017 results posting a 1.9% decline in core earnings per share (EPS) to Kshs 1.48 from Kshs 1.51 after adjusting for the scrip shares. The decline in EPS is attributed to a 5.0% growth in operating expenses to Kshs 9.3 bn from Kshs 8.9 bn registered in Q1’2016, which outpaced a 2.7% growth in operating income to Kshs 15.9 bn from Kshs 15.5 bn registered in Q1’2016. The board of directors did not recommend payment of an interim dividend. KCB Group registered improved performance on the loan book, which expanded 14.3% y/y. Despite this growth, we expect loan growth to ease off in 2017 as the bank adjusts to the loan-pricing framework brought about by the Banking (Amendment) Act 2015. Continued implementation of cost reduction measures through adoption of digital platform and other alternative channels of distribution for both loan disbursement and deposit mobilisation. This will help the bank achieve efficiency and keep the cost to income ratio at manageable levels. For a more detailed analysis, see our KCB Group Q1’2017 Earnings Note. The board of directors recommended a final dividend of Kshs 0.97 per share, resulting to a dividend yield of 4.8% as at Friday’s closing share price of Kshs 20.5. Going forward, Safaricom will thrive on the expected gains from investments in innovation and technology in new businesses such as fibre to the home, and the e-commerce platform, where it has launched a tap-and-go M-Pesa card intended to ease mobile money payments, the card will allow customers to make payments at retail point-of-sale (PoS) terminals. The company is also keen to revamp the data platform by investing in their network to enhance capacity, coverage and quality, including the rolling out of 4G network to additional sites in 40 out of the 47 Counties. For a more detailed analysis, see our Safaricom FY’2017 Earnings Note. Coop Bank moved from a “Hold” recommendation with an upside of 6.2% to a “Sell” recommendation with a downside of 8.0%, following a 16.4% price increase. Accumulate – Buying should be restrained and timed to happen when there are momentary dips in stock prices. We remain "neutral with a bias to positive" for investors with short to medium-term investments horizon and are "positive" for investors with long-term investment horizon. Private equity fund, Catalyst Principal Partners, has acquired Jambo Biscuits, makers of flagship brand Britania, under a newly established firm, Britania Foods Ltd. This is the first investment by Catalyst with its second fund Catalyst Fund II, which hit its first close earlier this year, at USD 103 mn (Kshs 10.6 bn) and is eying a final close of USD 175 mn (Kshs 18.1 bn) by the end of the year. Catalyst continues to expand its portfolio, this time focused on fast moving consumer goods. Their first fund, Catalyst Fund I, is invested in nine companies in the manufacturing and consumer goods, financial services and healthcare sectors across the East Africa Region. For Britania, the investment will support the company’s strategic plans, which include; a factory upgrade, innovation of new products and diversifying their offering. Cytonn Investments’ Private Equity division this week completed the acquisition of a 25.0% stake in Superior Homes Kenya Limited (SHK). SHK is the developer of the 160-acre Greenpark development on Mombasa Road. Cytonn expects to couple the capabilities of its development affiliate, Cytonn Real Estate, in land acquisition, sales and distribution and fundraising, with Superior Homes’ strong record in developing master-planned satellite communities to develop more neighborhoods such as Greenpark. Travel giant, Thomas Cook India Group, a travel company listed on the Bombay Stock Exchange, has bought out Nairobi-based safari operator, Private Safaris. Private Safaris is part of Kuoni’s Destination Management Specialists (DMS), which is one of Kuoni Group’s core activities. The other DMS brands include AlliedTPro (USA), Asian Trails (South-East Asia), Australian Tour Management (Australia) and Desert Adventures Tourism/Gulf Dunes (Middle East). Private Safaris arranges tours to Eastern and Southern Africa destinations. The acquisition is strategic as (i) it makes Thomas Cook a multinational player with a global network of destination management specialists, and (ii) Thomas Cook India, through Private Safaris has access to Africa, which is one of the world’s most attractive tourist destinations. Vumela Enterprise Development Fund, a fund managed by FNB Business Banking and Edge Growth, acquired a stake in Nova Pioneer, an independent school network in South Africa offering pre-school through secondary education for students from ages 3 through 19. The investment is a USD 1.1 mn (Kshs 115.9 mn) debt investment into Nova Pioneer, which is part of the Nova Pioneer Education Group, which currently offers a primary and secondary school education in four Schools, all based in Johannesburg and is affiliated to Nova Pioneer Kenya that offers two secondary schools and a primary school. Vumela has other investments in other early businesses, including UBER in the Uber Driver Guarantee Scheme and FB Mining, a company that provides specialized ventilation seals for mining operations. The investment is advantageous to Nova as it will enable Nova to (i) implement its strategy to offer a globally competitive learning experience at a price point accessible to lower middle class families, and (ii) create their target capacity for 15,000 learners over the next five-years. The number of exits achieved by private equity firms in Africa continues to grow as recorded by a report dubbed “How Private Equity Investors Create Value”. According to the report, prepared by EY and African Private Equity and Venture Capital Association, 48 exits were achieved in 2016, a 9.1% increase from the 44 exits achieved in 2015. The exits were achieved by 31 PE firms, compared to 30 firms in the prior year. The bulk of exits were concentrated in South Africa, with 44.0% of the exits, followed by West Africa (25.0%), North Africa (25.0%), East Africa (4.0%) and Southern Africa (2.0%). By industry and sectors, the industrial sector was the best performing with 21.0% of the exits, with exits to trade buyers still representing the most common exit route. Exits to other private equity firms and other financial buyers increased to 17, from 7 in 2015. Comparing exits’ performance over the last 10 years, the top 5 countries, South Africa (42.0%), Nigeria (9.0%), Egypt (9.0%), Kenya (6.0%) and Ghana (5.0%), accounted for 70.0% of PE exits. Despite recent economic hardships experienced in a number of African countries, African PE sector continues to develop with fintech, consumer goods and services, education, healthcare and energy as some of the key sectors of interest to investors. Private equity investments in Africa remains robust as evidenced by the increased deals and deal volumes in the region’s key note sectors; Education, FMCGs, and hospitality. The increasing number of exits also indicates investors’ confidence in the sector. The increasing investor interest is attributed to (i) rapid urbanization, a resilient and adapting middle class and increased consumerism, (ii) the attractive valuations in private markets compared to global markets, and (iii) better economic projections in Sub Sahara Africa compared to global markets, we remain bullish on PE as an asset class in Sub-Sahara Africa. Going forward, the increasing investor interest and stable macro-economic environment will continue to boost deal flow into African markets. During the week, Knight Frank released the Prime Global Cities Index Q1’2017 Report, which tracks the price movement of luxury residential property across 41 cities in the world. The report recorded an overall increase in index by 4.3% between March 2016 and March 2017. Guangzhou City, in China, led in the rankings, with luxury prices up by 36.2% in the year leading to March 2017. The prices of luxury homes in Nairobi declined by 2.7% between March 2016 and March 2017 and by 0.2% between September 2016 and March 2017. The prices, however, recorded a 0.9% increase in Q1’2017. The 2016 performance was attributed to exit of diplomats and downsizing of international companies hence decreasing demand for luxury houses. The recovery of prices in Q1’2017 can be attributed to high risk investors locking money in real estate to hedge against elections risk and gain from the expected price appreciation after elections when the industry rebounds. The following table shows the performance of the residential sector over the last three years. In a bid to reduce the housing deficit, concentrated mostly in the low-income segment, Sacco’s and Cooperatives are increasingly investing in and developing affordable housing units. This was evidenced this week as Lancet Housing Co-operative Society, associated with Pathologists Lancet Kenya, unveiled plans to build 190 houses that will comprise of two, three and four-bedroom maisonettes and apartments in Mavoko, Machakos County. The project is set to break ground mid-year 2017 with the houses being sold to members of the cooperative and the public at prices ranging between Kshs 5.0 mn and Kshs 10.5 mn. Other Sacco’s also investing heavily in real estate include Urithi Housing Cooperative, Safaricom Investment Cooperative and Stima Sacco, all which have most of their developments with price points of less than Kshs 10.0 mn. These Sacco’s can achieve these low-price points as they have relatively lower financing costs given that they use member’s savings to develop housing units for sale to both members and the public, and offer dividends to its members and mainly locate their projects in satellite towns where land is relatively affordable compared to CBD. With this mode of operation, they incur no or minimal cost of finance. We thus expect to see more financial institutions venturing into real estate as developers with a focus on affordable housing seeking to enjoy the high returns of approximately 25.0% p.a. This will be boosted further by government support to the affordable housing sector with incentives such as the 50.0% tax waiver given to the developers who achieve 400 low - cost units per annum, elimination of NEMA and NCA fees, digitization of land records and increased transparency in the lands ministry as well as issuance of title. Infrastructure is a key driver of real estate establishment and government has been on the frontline to ensure all parts of the country are accessible. Over the week, the government has announced completion of designs for the 210-kilometre highway connecting Malindi to Lunga Lunga at the Coast, a road that is part of Lamu-Dar es Salaam corridor, which links Kenya and Tanzania and the construction of the 45-km Kombani-Kwale-Kinango road expected to begin in July 2017. These roads are expected to contribute positively to the economy and the real estate sector as they will open up the Coast region to investors and thus boost the tourism and hospitality sector, trade in the region and open the rural areas for development due to accessibility and enhanced communication. Nakumatt Supermarkets announced its plans to close its poorly performing branches in Kenya and Uganda and cut on non-profitable retail products. It has scheduled the shutdown to start with the Haile Selassie Branch in Nairobi and one of its warehouses along Mombasa road, Nairobi, and aims at saving approximately Kshs 1.5 bn annually. This follows the closure of its Kenyan Branch in Nairobi along Ronald Ngala Street and Katwe branch in Uganda. The retailer has been experiencing financial strains and all these plans are in aid to reorganize its capital structure and hence return it to profitability. Security services firm, Security Group Africa (SGA) has opened a new head office in Nairobi Tulip House, along Mombasa Road, in a move to improve communication and support for its country offices in East Africa. This indicates that Nairobi remains the preferred commercial hub in the region. We expect the real estate sector to continue doing well due to continued investment in the residential sector with a key focus on low cost and affordable houses by private developers as well the government. Increased infrastructural development will open up other areas in Kenya to development and boost the tourism and hospitality sector. The Banking (Amendment) Act 2015 has drawn both plaudits and critics since its introduction in Q3’2016. The amendment stipulates a deposit and loan pricing framework, with (i) a cap on lending rates at 4.0% above the Central Bank Rate (CBR), and (ii) a floor on the deposit rates at 70% of the CBR. There was a mixed view on the impact of capping interest rates, with some looking at it as being able to make loans accessible to most Kenyans, while others viewed the introduction of the rate cap as being detrimental to the economy. We wrote severally on the matter, and also an article summarizing our view at the time: Interest Rates Cap is the Kenya’s Brexit – Popular but Unwise. Now that it is months after the law came into effect, we have seen some activity aimed at looking at the impact that the capping of interest rates has had so far on the economy. In January 2017, the International Monetary Fund (IMF) expressed concerns about interest rate capping and its negative effect on private sector credit growth and banking sector earnings, noting that it may be necessary to repeal the act as maintaining the same would end up taking a toll on Kenya’s financial stability, whereas the Central Bank (CBK) has come out and stated that it is finalizing a study on the effects of the law and its impact on the economy, while working closely with the Kenya Bankers Association (KBA). With all this happening, this week we seek to analyze the impact of the interest rate caps on the economy thus far and whether it will be sustainable to maintain the Banking (Amendment) Act 2015. The latest data from the Central Bank (CBK) indicates that private sector credit growth slowed to 4.3% for the 17th consecutive month in December 2016, and subsequently to 4.0% at the beginning of 2017, way below the government set target of 18.3%. While it is expected that private sector credit growth will stabilize at current low levels, we cannot fully attribute it to the interest rate caps, bearing in mind private sector credit growth had slumped for the 13th consecutive month, to 5.4% in August 2016, when the interest rate caps bill was signed into law. CBK has attributed the slow-down in credit growth to structural factors in the banking sector, evidenced by increasing levels of non-performing loans and subsequent provisioning, as opposed to monetary policy decisions. Despite this, it is clear that the enactment of the Banking (Amendment) Act 2015 has not served to help the situation on credit access as was expected by policy decision makers. According to CBK, the share of loans to corporates increased relative to small businesses and personal loans since the capping of interest rates, with the number of loan applications received by banks increasing between September and December 2016, and the average maturity of these loans shifting to the shorter term. However, loan approvals declined by 6.0% between December 2016 and February 2017. The fourth quarter of 2016 also saw a 4.7% decline in savings accounts following a 9.6% decline recorded in Q3’2016, which indicates the continued re-classification of savings accounts into checking accounts by commercial banks, following the capping of interest rates. During the MPC meeting held in March, the committee noted that the available data at the time was inadequate to make a conclusion as to the impact of the Banking (Amendment) Act 2015 on the banking sector and the economy in general. However, breaking down the NII over the quarters of the year, it becomes evident that while the general performance of NII in the banking sector was better than expected over the whole of 2016, the fourth quarter of the year saw 6 out of the 11 listed banks record the lowest quarterly NII margin, with 3 relatively unchanged during the quarter and only 2 banks, Diamond Trust Bank and I&M Holdings, posting the best margin in Q4’2016. Given now that 3 banks, NIC Bank, Stanbic Bank and KCB Group have released Q1’2017 results, the effects of interest rate capping on the banking sector are becoming more apparent as the banks posted 3.9%, 9.3% and 1.9% declines in core earnings per share (EPS), with NII dropping by 8.4%, 12.4% and 4.7%, respectively. 2017 being the year in which the full impact of the Banking (Amendment) Act, 2015 will be felt, and as highlighted in our Cytonn Weekly #16-2017, we are likely to witness banks’ push for efficiency gather pace to balance off the expected reduction in absolute profitability going forward as they shy away from physical branches model, which are very expensive compared to other alternative channels such as digital platforms. While the capping of interest rates has rationalized interest rate spreads in the banking sector, it has led to challenges such as (i) locking out of SMEs and other “high risk” borrowers, who cannot fit within the 4.0% risk margin, from accessing credit, with banks preferring to lend to government, (ii) the continued slump of private sector credit growth, slowing to 4.0% in the first quarter of 2017, which is primed to adversely affect GDP growth for 2017, (iii) widespread lay-offs in the banking sector as banks adjust to the challenging operating environment brought about by the current regulatory framework, as well as in other major sectors of the economy, which is bound to take a toll on the unemployment levels in the country, reported at 39.1% in 2016, and (iv) straining small banks who effectively have been shut out from the interbank market and now have to mobilize funds at rates higher than what they are getting now and can only lend out within the stipulated margins. It is clear from the above that the effects of interest rate capping, while yet to be fully felt, are more disastrous than productive with the cons far out-weighing the pros, and the onus is on policymakers to arrest the situation before it gets out of hand, impacting negatively on the economy. There is, however, an opportunity for structured financial products and private equity players to come in and provide the much needed capital by SMEs and other businesses to grow, as the opportunities remain really promising on a risk adjusted basis. The Banking (Amendment) Act 2015 has done more bad than good on the economy thus far, and if the situation is not arrested, could impact negatively on the economy. It has failed to live up to initial expectations of cheaper and more access to credit – there is simply no evidence of cheaper and more access to credit, and if anything, credit growth has continued to decline. Credit growth is now at 4.0% compared to 5.4% when enacted and way below the policy target of 18.3%. Cost rationalization measures are primed to see continued lay-offs in a challenging operating environment.